With at least eight City Council members considering a mayoral run in Boston, a slew of possible candidates are beginning to line up for what could be the best chance in years to join the 13-member body. Mayor Thomas M. Menino’s announcement last week that he would not seek reelection after 20 years created a political vacuum, sucking a number of city councilors into mayoral speculation and, in turn, sparking a second level of competition for their seats. Council members who run for mayor will automatically put their seats up for grabs in the fall election. Councilor at Large John R. Connolly was the first declared mayoral candidate, while fellow councilor at large, Felix Arroyo, is raising campaign funds and is “seriously considering” a mayoral run. Neither of the other two councilors at large, Ayanna Pressley and Stephen J. Murphy, has ruled out running for the mayor’s office either. With the potential of two, three, or even four of the citywide seats open, a slate of council hopefuls are gauging their chances, honing fund-raising strategies, and sounding out supporters. 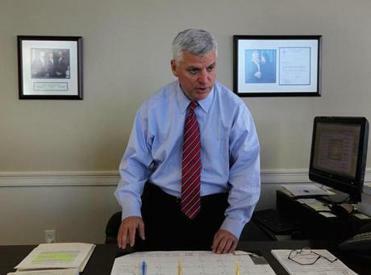 The Suffolk district attorney formally launched his bid with more than $866,000 in his campaign coffers and the muscle of almost 20 years in elected office. So far, Michelle Wu is the only declared at-large candidate. The 28-year-old lawyer, who has support among Boston’s liberal establishment, kicked off her campaign Tuesday night in the South End, where she was introduced by her former law school professor and mentor, Senator Elizabeth Warren. “I pledge to Boston families and residents that I will always work hard for our families in every neighborhood,” Wu said over the crowd’s applause. About a half-dozen others have told the Globe they are closely watching the developing mayoral race and are considering joining Wu in the contest for an at-large council spot. Former City Council president Michael F. Flaherty and Jack Kelly, formerly the mayor’s Charlestown neighborhood liaison, both said Wednesday that they are leaning toward running for a citywide seat. Flaherty, who has also floated himself as a potential mayoral candidate, lost to Menino in 2009 and failed to win back an at-large seat in 2011. He plans to make his decision in the next week. Kelly, who works as a community relations manager at Massachusetts General Hospital, said he has heard from supporters and thinks he could compete citywide. “I know the city and I also have a vision for it,” he said. Former council candidates Craig M. Galvin and Dan Ryan both said they are fielding calls from supporters urging them to enter the race. Given the right circumstances, both said they would consider an at-large run. Many of the would-be at-large candidates stressed that their decisions will hinge on the number of at-large council incumbents who run for mayor, and not who else may vie for the open spots. The at-large race will also be influenced by whether district seats open as a result of councilors entering the mayor’s race. At least four district council members — Tito Jackson, Michael Ross, Robert Consalvo, and Charles Yancey — have said they are considering a run. Because councilors who run for mayor must vacate their seats, the Menino effect could infuse a wave of fresh faces across the council roster. “I’m not going to challenge an incumbent, but if the District 7 seat opens up then yes, I’ll probably jump in,” said Sheneal Parker, a teacher who was defeated by Jackson in 2011. Parker said she is closely watching the at-large seats. If a second one opens, she said, she would consider a citywide run. “If there’s an open seat, I’m going to consider it,” she said. Correction: Because of a reporting error, an earlier version of this article incorrectly stated when Dan Ryan ran unsuccessfully for the City Council. His failed run for the District 1 seat was in 2006.